What is more practical the articles will help You, what kind of social magic use to promote our and Your content on resource to get most of it. Naturally it goes to portal's help then. Also You can just take a practice and use it anywhere on the web or You can do nothing and we do all the promotion work for You. For one people #socialmedia is natural marketing tool for others wasting time. For the first category the big three (now it's four of it I guess, LinkedIn too, how to range them I not too sure) #socialmedia resources are default tools between dozens of others. For the second category FB is kind of default, Twi is a misery and G+ is a copy of FB that nobody cares of or pretty similar too. 1. We are filling profile. It's Your face and people don't like to talk with robots. Icon, about text, link to the resource on the web, lists, tags for them and so on. 2. We make and share our own content. So we need to make it proper, nice, positive, interesting and shareable/viral. From one side it's boring and annoying to post only Your [promotional] content, from the other only reposts of popular contend won't do. So we are balancing. One or several posts of our recipes, articles, charts and bunch of re-tweets and reposts. 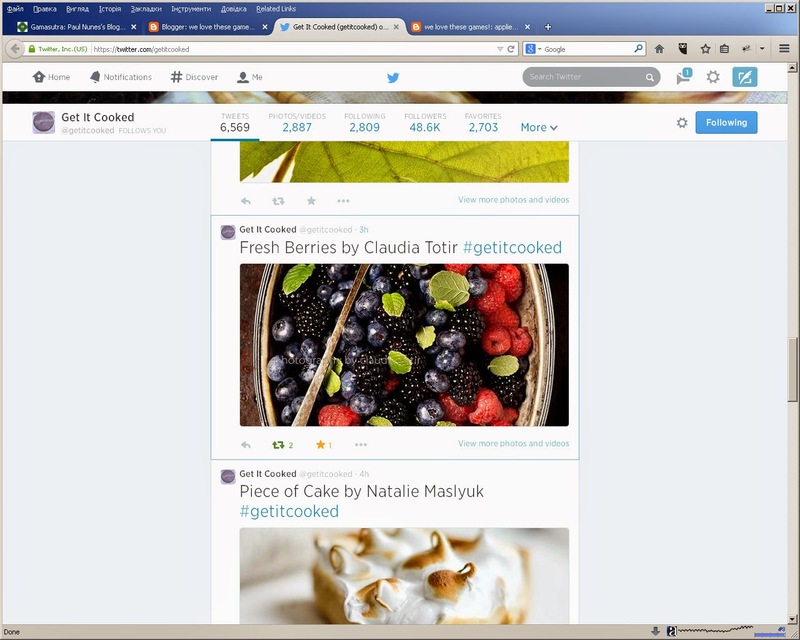 5.1 Find nice relevant images and re-tweet, people like fast to accept content. 5.2 Find famous cooks by restaurant or book, showing them our implementations of their recipes, asking for feedback or more info. 5.3 When somebody favs or re-tweets Your content it's kind to return a favour. Also You'd better reply to questions and DM, like we do. 6. Weekly interactions like Follow Friday or weekly recipes chart is a good practice too. Get It Cooked portal has been launched, slightly modified part of the first article is already there: Welcome to the world of socialmedia magic: Twitter short overview alsoalready there: Welcome to the world of socialmedia magic: Twitter short overview also there some help, howto and tutorial articles like How to get registered (sign up) on our web site and How to sign up on our website using an Email. 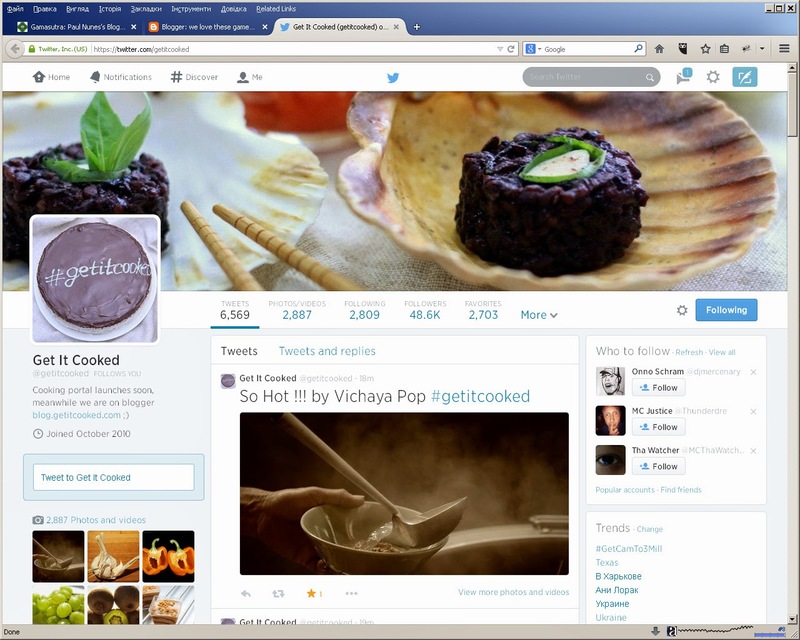 How to post recipe and the third how to use twitter to promote it are next. 1. Try to recreate our practice step by step or modified, not to hard, just time utilizing. Welcome to read step by step instructions in help section on our portal, coming pretty soon. 2. Let us do some work for You and use our social magic. Recipes, articles and restaurants on our portal of Get It Сooked are going to be promoted active way described above if they meet quality guidelines and extremely active way if featured. [UPDATED #4] Portal of Get It Cooked has been launched, we are working on it's promotion over social media. Once again modified version of this article appeared in publication section @ getitcooked and @ LinkedIn pretty soon. Article about Twitter should be short still :) What do You think? [UPDATED #5] The most applied article, step by step howto is here at GetItCooked in publications/tutorials/howto section. I guess it's proper place and no need mirror it here. The next article is still about Pinterest.